Many, many thanks to you and your associates for educating us all so we can achieve climate stability. We have created another pathway in support of our collective efforts, namely to offer gratitude to the spirits of life for our precious lives directed towards healing our beloved earth. By gathering around the sacred fire connecting with each other and the spirits of life, we contribute to a global network of people participating in rituals under Full Moons to call on the spirits of life to help us create climate stability. 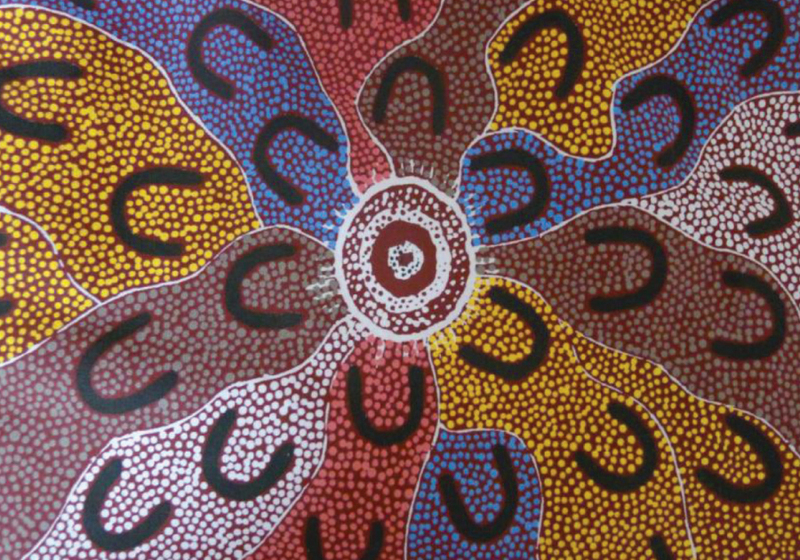 This aboriginal Australian image — horseshoe images are diverse participants seated on the ground facing the sacred fire—captures our call to celebrate the sacred in living systems and ourselves. For many centuries, our ancestors across the world, have offered thanks and gratitude for their lives with the setting of the sun. With our 24-7 lives, this intimate collection of each soul offering thanks in her and his own way, has been lost to many of us. These days many of us, ourselves included, spend a great deal of time in thinking rather than quality time in reflection or expanding heart energy. We have observed that when there is a deep connection with all living systems we achieve a much more balanced approach to challenges in our lives. Further, when a space is presented in which we can join together in gratitude for our beautiful lives, we experience healing, which we all so sincerely need. As a student of shamanism, I received a call from the Spirits of Life that they do not trust the Human Family to heal the climate and want to help us. I was asked to connect shamans on each continent to call on spirits of life to help us heal the climate. Over the last 9 years, I have been seeking to produce the Systems to Heal the climate. I have included a description of this action and a current status report on the project. We seek to ally with communities radiating from each Holder to support ecosystem healing on each continent to celebrate life and grow in awareness that the human family is both a supra-organism in the destruction of living systems and, as well, can serve as a collection of hearts and minds intent on healing living systems. Can we participate in practicing truth and reconciliation through our intentions and actions by acknowledging our polluting and destructive practices that impact living systems and, nonetheless, lift up system healers in myself and among ourselves to sustain all life? Imagine, if you would, masses of heart energy sourced from each continent, connecting with each other, all offering the spirits of life gratitude every Full Moon. Imagine how each person participating in these experiences could be profoundly moved to extend this healing into themselves, their communities and neighboring communities. We do not know what might result from these Holders connecting to one another and with the rest of us. We do know that Systems to Heal the Climate is an action that complements your advocacy and others and that it is important to reduce our global footprints, not invest in fossil fuels, and bring down parts per million of particulates to 350, in addition to offering healing energy to all living systems. You can count on us to communicate through ritual and education drawing out the experience of our interconnectedness and responsibility by offering gratitude for our precious lives. We would be honored to receive your endorsement and invite you to collaborate with us in any way you feel appropriate.